This Wednesday, December 12th at City Hall in Riverside California, TCU/IAM is hosting a rally to protest Amtrak’s decision to shut down its call center in that community a move that will cost 500 union jobs coming right after the holiday season. 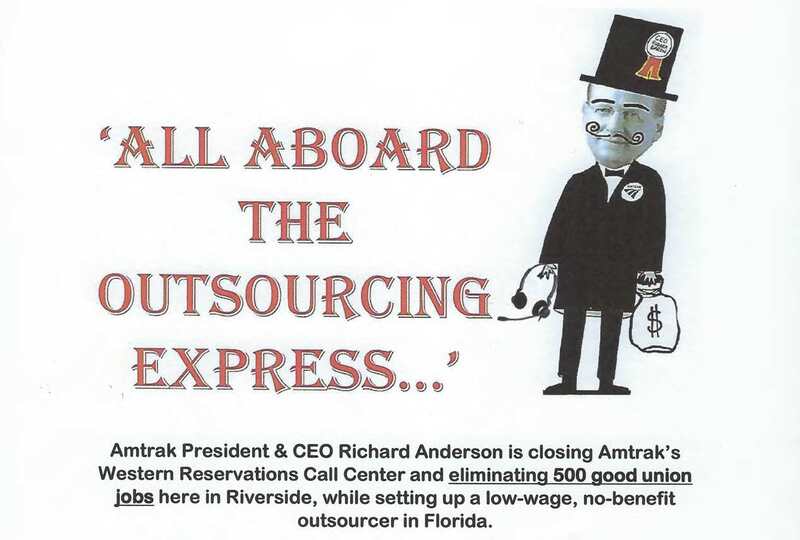 Please see the flyer for information and come stand with our brothers and sisters and send a message to Amtrak that eliminating 500 good jobs in Riverside, while setting up a low-wage, no-benefit outsourcer in Florida is unacceptable. Click here for a printable version of the flyer about the Dec 12th rally. The post Wednesday December 12 – TCU Members at Amtrak Rally to Save Union Jobs appeared first on IAMAW .